That 43 percent LTBI rate among refugees from sub-Saharan Africa is more than ten times greater than the four percent LTBI rate among the general population of the United States. Though the general population of the U.S. has a very low rate of latent TB infection—four percent—the rest of the world has a much higher rate of latent TB infection. As more than three million refugees have migrated to the United States in the past three decades (and another estimated ten million illegal immigrants), these migrants have brought their high rates of latent TB infection with them. 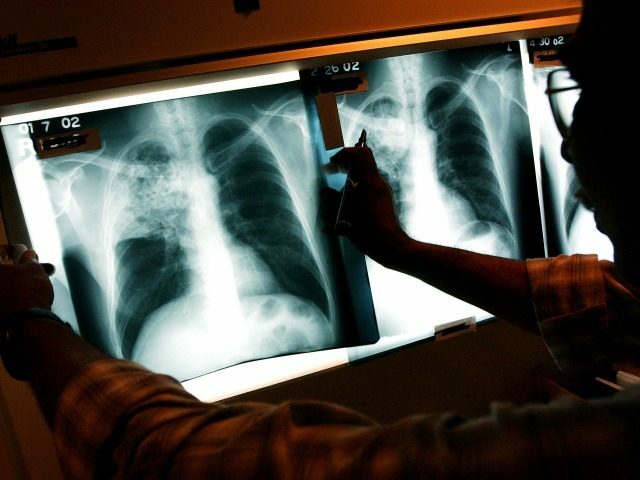 “Eighty percent of active TB cases in the U.S. are the result of reactivated LTBI, especially among individuals born in endemic areas,” according to another recent study conducted by the University of Louisville Global Health Center. Tuberculosis (TB) in the United States is primarily a disease of foreign-born people. In 2011, approximately 62% of all incident TB cases within the United States occurred among foreign-born individuals, a proportion that has been increasing steadily since 2001. Within the first few years after arrival in the United States, immigrants and refugees from countries in which TB is highly endemic have been found to develop active TB at rates more similar to incidence rates in their home countries than those of the United States, which has been documented to be largely because of reactivation of latent TB infection (LTBI) acquired abroad. Among foreign-born people in the United States, the risk for active TB is particularly elevated for immigrants and refugees from sub-Saharan Africa and Southeast Asia. Refugees resettling in the United States have typically originated from regions with high rates of active TB, including Southeast Asia and sub-Saharan Africa. In addition, previous studies have documented that refugees have higher rates of TB after resettlement in the United States than other foreign-born people. Although active TB disease among refugees is usually diagnosed and treated before departure for the United States, the treatment of LTBI before arrival in the United States is not mandated. To prevent the reactivation of LTBI after arrival to the United States, the Centers for Disease Control and Prevention currently recommends screening for and treating LTBI among all recently arrived refugees. Despite the Centers for Disease Control and Prevention’s recommendation, there has been only limited assessment of the prevalence, epidemiology, and treatment rates of LTBI among newly arrived refugees in the United States. Previous studies of LTBI among refugees in the United States were primarily conducted during the previous decade and do not reflect changes in the demographics of more recent refugee arrivals. Additionally, few reported LTBI treatment completion rates. The majority of these studies were also conducted before the introduction of interferon γ release assays, TB screening tests that provide a more accurate diagnosis of LTBI because of their higher specificity than the tuberculin skin test. Assessment of LTBI prevalence and treatment among recently arrived refugees is needed to effectively address the control of TB, because untreated, reactivated LTBI in this population may be an important contributor to TB incidence in the United States. This information is critical for public health departments that provide care for refugee populations, not only to ensure the health of individual refugees, but also to prioritize efforts to reduce the disproportionately high rate of active TB among foreign-born people in the United States. In this study, we investigated LTBI prevalence by birth region and clinical risk factors, and identified demographic and clinical factors associated with LTBI treatment initiation and completion among newly arrived refugees diagnosed with LTBI in San Diego County from January 1, 2010, through October 1, 2012. Domestic medical screenings of refugees subsequent to arrival are voluntary. Depending on the state, from 80 percent to 99 percent are screened, which meaning 1 percent to 20 percent of the 70,000 high risk refugees that arrive are unscreened. Latent TB infection (LTBI) rates are high among refugees—from 22 percent in Minnesota to 26 percent in Indiana to 35 percent in Vermont to 43 percent among Sub-Saharan refugees in San Diego County, California. Participation in treatment subsequent to detection of latent TB is voluntary among resettled refugees. As a consequence, successful treatment rates are all over the map, ranging from a low of 36 percent in San Diego County, California to a high of 86 percent in Minnesota. Most of the 49 states in which the federal government resettles refugees, however, like Tennessee, North Dakota, and Massachusetts, fail to report either LTBI rates among all resettled refugees or the percentage of those who test positive for LTBI who successfully complete treatment, despite the requirements of the Refugee Act of 1980 that all such medical results be reported to the county public health departments in each county where refugees are resettled. Cases of active TB in the United States increased by 1.7 percent in 2015 to 9,563, the first increase after 23 years of steady decline. In 1989, the CDC set a goal of eradicating tuberculosis by 2010, but the United States is now seeing more, rather than fewer cases of the virulent and deadly disease, which continues to plague much of the rest of the world. Despite the UC San Diego study’s findings that TB control and prevention requires a focus on “increased treatment rates among high-risk refugees with LTBI,” and CDC’s own guidelines that the United States TB control policy should “[t]ake concerted action to prevent TB among the population of U.S. residents with LTBI by identifying those at highest risk for progression to TB disease through targeted testing and administration of a curative course of treatment,” and “[r]educe the rising burden of TB from recent transmission of M. tuberculosis by identifying settings at high risk for transmission and applying effective infection-control measures to reduce the risk,” actual treatment of refugees with latent TB infection continues to fall far short of that mark. With so few states and VOLAGs (the voluntary agencies who receive more than $1 billion annually from the federal government to administer the refugee resettlement program) actually reporting the relevant refugee medical data, it is impossible at present to determine the complete magnitude of the public health risk the high rate of LTBI infection among refugees poses to the general population.